I’m in the middle of working on a review for Bodies #4 and I just unearthed this review of the first issue, which I never actually put up anywhere. Stay tuned for the more current review! The premise of Bodies is simple and weird: a mutilated corpse is found on the same square cobblestones in London’s East End in 1890, 1940, 2014, and 2050. In each of those years, a detective encounters this corpse. Writer Si Spencer and colorist Lee Loughridge combine talents with a different artist for each of the detective characters. The body is a puzzle for the detectives, and the detectives are part of the puzzle for us. Tula Lotay’s 2050 segment elevates the book to being more than a collection of competent cop dramas with a twist. Lotay’s piece of this mystery mainlines the themes of identity and humanity that run through the whole story. Spencer uses the thoughts of each detective protagonist for intimate but unreliable narration. The writing shifts in tone with each change of artist and time period. The art in Meghan Hetrick’s 2014 segment is smooth, clinical and washed in blue tones. Hetrick’s detective thinks, “I try not to think of these thugs as people,” and is guarded by layers of toughness, snark, hijab, riot gear, and protective crime-scene coveralls. Dean Ormston’s detective wears a bowler and spectacles in 1890, and his world is finely etched and colored in black, white, and gray with pops of bright red. When this inspector photographs the corpse he believes he’s capturing “the hidden heart of humanity.” In 1940, Phil Winslade’s detective wears pinstripes, a fedora and an Anglicized alias. “You’re just a message,” he says to the Irish guy he’s about to torture. Winslade’s pages have the heaviest lines and even though Loughridge uses more colors and more illumination, these pages feel the darkest. The experiment of holding some variables constant (place, corpse, writer, colorist) while shifting others (decade, detective, artist, tone) makes this book a really intriguing read. The 1890, 1940 and 2014 segments show us a cop whose own identity has something to do with the ambient crime surrounding him or her. They are a side-by-side study of how to convey darkness in the city. Spencer and Loughridge are impressive in how well they marry themselves with each artist to create something so varied yet seamless. Still, when you look at these three segments individually, you feel like at least one analogous British television series already exists for each one of them. The future segment (which comes third in the book) is what elevates Bodies above being just a gritty detective drama with a supernatural twist. 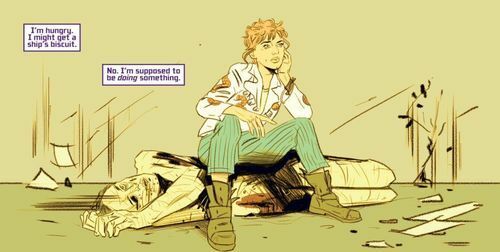 Tula Lotay’s scenes of Detective Maplewood and the body in 2050 are the freshest-looking and weirdest-feeling pages in the book. There are fewer words, but the shape and feel of them matter more. “Who are you and what do you remember?” Maplewood asks the corpse, because at first she can’t recognize that it’s a dead thing. Maplewood’s cognitive problems make her the least mannered and most relatable of the detectives. When she laughs hysterically at her own grim joke it feels like the realest part of the book. The sky above London is yellow in these six pages. The colors and lines are loose and light, with details washing out from a small central area of focus like an anxiety dream. Some of the lines look hastily drawn by crayon or grease pencil. Even though this part might seem like poetic nonsense compared to the other more straightforward pieces, it looks the freshest and it has some of the most compelling clues and details. Each segment on its own has enough intrigue and personality for a whole comic but might not have worked for more than six pages in a row because of tone. Each is too much of something—too slick, too mannered, too oppressive, or too surreal—but it’s a pleasure to switch between them. 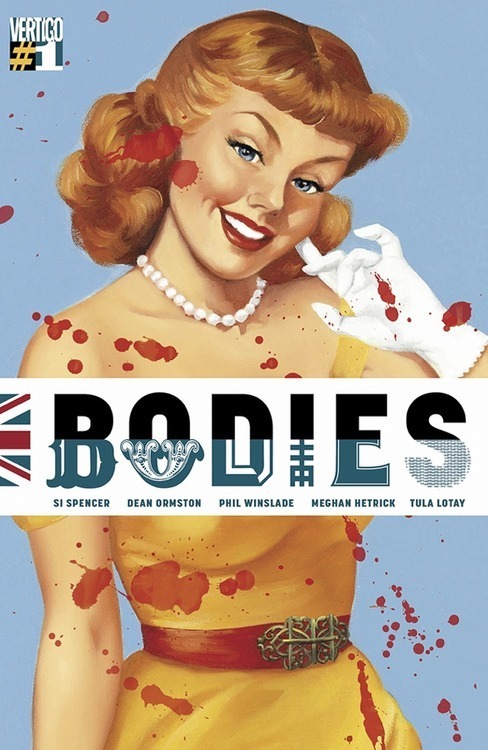 Spencer has eight issues to lay out and solve this mystery he’s setting up in Bodies. This is a hugely ambitious project with separate spheres of politics, circumstance, personality and vice in each of the four segments. Together they slide and lock into place, letting us forgive and keeping us interested in the game.